All transactions are safe and secure with a reliable history in online purchasing behind each of our associates. 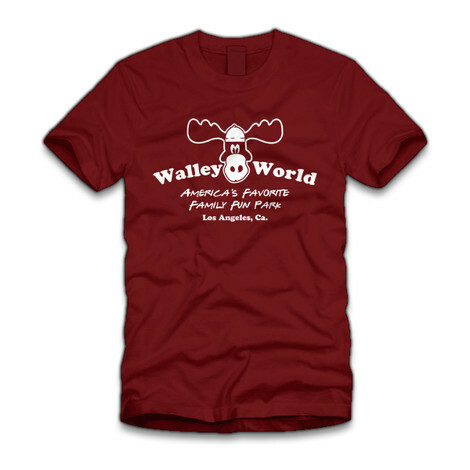 Buy the National Lampoon's Vacation Wally World t-shirt to own Christmas Vacation clothing and merchandise. This souvenir style tee is a memento from the fictional theme park featured in the first National Lampoon's Vacation movie. In an effort to spend more time with his family, Clark Griswold leads his wife Ellen (Beverly D'Angelo) and their children, Audrey and Rusty, on a cross-country trip to visit the Wally World theme park. This bestselling National Lampoon's Wally World t-shirt is a tribute to the fictional theme park that is meant to be a parody of Disneyland. In addition to the National Lampoon's Vacation Wally World tee above, browse the Christmas Vacation Clothing Gallery for more apparel like men's and women's clothes, kids shirts or hoodies.